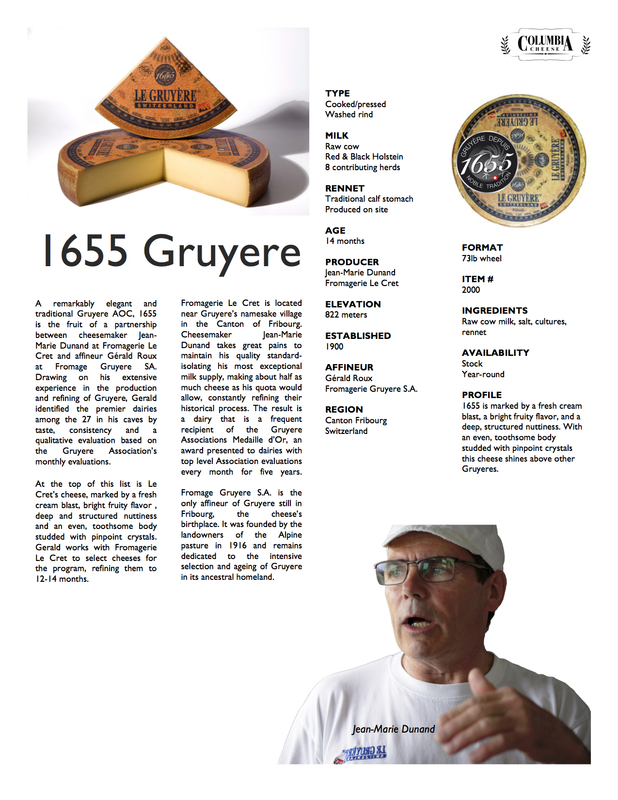 A remarkably elegant and traditional Gruyere AOC, 1655 is the fruit of a partnership between Jean-Marie Dunand at Fromagerie Le Cret and Gérald Roux at Fromage Gruyere SA. 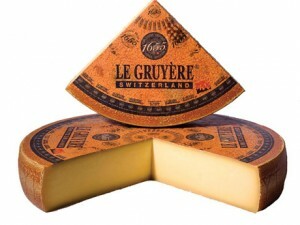 Drawing on his extensive experience in the production and refining of Gruyere, Gerald identified the premier dairies among the 27 in his caves by taste, consistency and a qualitative evaluation based on the Gruyere Association’s monthly evaluations. At the top of this list is Le Cret’s cheese, marked by a fresh cream blast, bright fruity flavor, deep and structured nuttiness and an even, toothsome body studded with pinpoint crystals. Gerald works with fromagerie Le Cret to select cheeses for the program, refining them to 12-14 months. Fromagerie Le Cret is located near Gruyere’s namesake Canton of Fribourg. Jean-Marie Dunand pains to maintain standard- isolating exceptional milk supply, making about half as much cheese as his quota would allow, constantly refining their historical process. The result is a dairy that is a frequent recipient of the Gruyere Associations Medaille d’Or, an award presented to dairies with top level Association evaluations every month for five years. Fromage Gruyere S.A. is the smallest public Gruyere affineur and the only one in the canton of Fribourg, the birthplace of Gruyere, Fromage Gruyere SA was founded by the landowners of the Alpine pasture in 1916 and remains dedicated to intensive selection and ageing of Gruyere in its ancestral homeland. AFFINEUR Gérald Roux, Fromagerie Gruyere S.A.
cheese shines above other Gruyeres.